The Robot Revolution exhibit at the Chicago Museum of Science and Industry is back from a national tour and will be at the museum until February 4, 2018. and then the exhibit will be touring across North America through 2020. Robo Thespian, a human-size robot, greeted us at the entrance to the exhibit and answered such pre-prepared questions as, How Smart are robots? and Can we work together? He said his goal is to work cooperatively with us to solve many of the world's problems. Since his answers were preprogrammed, I was impressed with him but not as much as I am with Cortana on my own computer. Never-the-less there was much to be impressed with inside this special exhibition as considerable progress has been made in the development of robots such as three types of robots who will be life changing for medical patients. First was the exhibition on how invasive surgery is possible for the surgeon on a computer screen. I took the two rods that controlled items on a screen and was asked to separate them into appropriate boxes. I quickly learned that the two had to work cooperatively. I had already been exposed to this in more detail at the Mayo Clinic in Minnesota where it is already a part of their practice of surgery. The explanatory material said, "With a 3-D high definition vision system, special instruments and computer software, surgeons can operate with enhanced vision, precision and control." Second was the exoskeleton that can be used for people who work with heavy loads or probably more importantly with physically handicaps in helping them walk and move around. A video alongside the powered exoskeleton device demonstrated a number of ways it could be used by the handicapped. Social robots can be used for healing. Some are capable of talking to patients who are lonely and for those with dementia who cannot communicate they can have soft animal robots whose heads, eyes and mouths move and who can be petted. While it was not discussed here, I am aware of Japanese men buying female robots as lovers and sexual companions. Game playing was very attractive to the children present. When I played a robot in the O-X game, he always let me move first and we always ended in a tie. When a robot dealer was working a casino table for blackjack, he beat me two hands and then asked me to give my seat to a new player. A game playing robot could be tied but not beaten. After my two losses the Robot asked me to let someone else play. A robot with only a head demonstrated eight different emotions, including disgust, anger, and happiness showing the progress being made in making robots more human. I sat in the seat of a mockup of a driverless car that gave an excellent demonstration of the many things a car must be tuned into to safely navigate the streets. Drones appear to be much further along than cars and a continuous demonstration of a drone was going on with help of children from the audience. Drones are being used for farming, fire control, police work, military tasks and a variety of other situations. Some robots were working to show how they could play sports like soccer, climb stairs and avoid hazards. I was aware of the usefulness of robots in the military and had a grandson who while in Iraq used them as part of his work on bomb deactivation and discovery. The robot exhibition area is so active that visitors need to get a time card allowing entry for a limited number of people at a time. When paying for my ticket on a computer I had to get a staff member to work the screen for me. It only took her three tries to get the program to work. Maybe some of us don't have the necessary skills for working with robots. This is a popular exhibition opening our minds to many ways that this technology is going to change our lives. 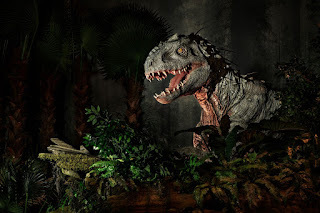 The Jurassic World: The Exhibition, until January 2018, at the Field Museum of Natural History in Chicago, is an unusual traveling exhibit based on the movie Jurassic World. The exhibit includes a blend of some realistic dinosaurs, some active entertainment, and some science fiction. Although my wife Carla and I basically enjoyed most of the exhibition, we were a few times confused about what was questionably science at this time by most scientists. A special 17,000 square foot plastic-walled perma-tent has been erected on the museum's front lawn for the exhibition, which has been so popular that visitors need timed entree tickets. Even with these limits we found the exhibition overcrowded making it difficult to hear the guide giving a tour of the fictional Isla Nublar on TV screens. Not knowing what to expect each new area was a surprise. When we entered a jungle like environment , we soon encountered a Stegosaurus and a Brontosaurus, who moved their heads, their eyes followed us and they were close to us. Next we entered a room that gave us "scientific" background how these were genetically created by taking dinosaur DNA from mosquitoes who had bitten them and then become incased in amber. To reassure us of the reality of this "scientific" approach a full wall of brightly lit amber is on display. This mix of fictional science from the movie and real science presented elsewhere in the exhibition may be bit confusing to some visitiors. 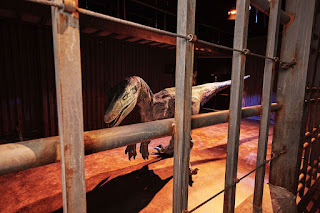 A case has three baby dinosaurs who have just broken out of their eggs and on the walls are displays explaining to visitors the "science" involved in their re-creation. The exhibition took on more reality as we entered the next space. A barrier stood before us and we were asked to wait a moment because a carnivorous velociraptor had been seen in the area. A carnivorous velociraptor attacked walls of his cage. And sure enough a moment later he came roaring around the corner full of noise and what looked like rage. He bit at the barrier and hit his head against it trying to break it down. We were all impressed but the kids in the group found him especially enchanting. However, mostly we were also being exposed to real science and could touch screens to learn more about the movie it was based on and others to give us real scientific information as it was known when the film was made. That is, these dinosaurs were covered in scales and had a certain coloring. The recent information we have on the subject suggests that rather than scales they may have been covered in feathers like their descendants the birds. Our biggest thrill was yet to come. We entered a fair-sized room that had a fence and a truck like the one used in the movie. We heard a roar and then saw the head of a T-Rex soon followed by his body. He also was in a bad mood and upon seeing the truck tried to tip it over. His head and mouth were so large he could have picked me up in it. A modified T-Rex was the scariest thing in the exhibition. Later in the Field Museum in the Stanley Field Hall I found that he was same size as the T-Rex Sue, 40 feet long. Sue who has 90% of the original dinosaur resides on the first floor and is a major attraction. In the upper level in Dinosaur Hall the Field Museum has a permanent, expanded collection including every major group, and the worlds they lived in. The Jurassic World exhibition opened last year in Franklin Institute in Philadelphia and has been at the Melbourne Museum, in Australia. The exhibition is a drop back into the world's very distant past. Fort Osage, Missouri existed from 1808 to 1828 and has been rebuilt as it existed during that period. Captain William Clark had picked this spot for a fort when the Lewis and Clark expedition had passed it in 1803. He came back in 1808 to build it as an outpost in the new Louisiana Purchase. One of its most important functions was to establish trade with the powerful Osage tribe who readily joined the Americans for two reasons: they wanted the trade items we made available to them and they needed our help in protecting their areas against other tribes such as the Ioway and the Cherokee. A re-enactor at the trading post explains the fur trading business to us. One re-enactor at the trading post had a great supply of different animal skins that he allowed us to feel the different tectures. Carla even got to try the fox skin as a neck piece, a common fashion statement during our 1930s. He showed us the trade goods most sought by the Osage: metal pots and pans, iron axes, beads, small bells, and for the men rifles and ammunition. The building was three and half stories, just outside the fort's gate. The Osage may have been friends, but the army did not want more than one or two in at a time inside the fort because of some experiences elsewhere where an Indian tribe had overpowered the soldiers by coming in under false pretensions or even dressed as women. Fur trading companies, unhappy with the U.S. government taking over the business, protested that the result was more “factories” were being closed--so the fort was shut down in 1828. The Osage also preferred the traders coming to them since it gave their enemies less opportunity to attack them. In the fort proper a re-enactor was easy to spot; the guy in old fashioned clothes sitting comfortably on a bench watching the visitors. He was in front of the captains' quarters and told us how the captains lived in contrast to the soldiers who were there. Eighty of them slept two to a bed, but when the team was reduced to forty, each got his own bunk. Two men to a bunk made sleeping conditions tight. This site was not a popular assignment for soldiers. It was isolated, there was little to do other than practice loading a rifle three times a minute, and food was so bad some of them got scurvy. Other soldiers took to growing their own gardens in order to have a better range of food. Constant problems involved who was in charge of the fort: Captain Eli Clemson or George Sibley, the manager of the trade with the Indians. The re-enactor pointed out that the post in the middle of the square was a punishment post. The rule breaker was strapped to it and whipped. That no or few women were available also contributed to the hardship. Following our inspection of the buildings and their facilities we went to the relatively new Education Center. Special funds had been allotted by the state and it is now used by many schools in the area as a study center, but not only of the fort but of the history of the area with emphasis on the history of the Native Americans who had inhabited the area. An18-minute film showed re-enactors in large numbers as if the fort was still in operation. We noted a fair number of civilians and learned that this was a sanctuary for early settlers and explorers. The displays in the main area start with a history of the Hopewell, goes on to more information about the Osage including an Osage hut and an Osage couple in natural surroundings. Other displays focused on objects from other tribes, plants and animals of western Missouri, information about the Lewis and Clark expedition and the history of the area. We were impressed with this as an excellent addition to the learning experiences available to visitors as well as the students in the area. The Osage were a tall, powerful people who used the fort as a protection against their enemies.